Recently I hosted a special workshop for my media communications students that focused on the use of graphic design in motion pictures. Not to be confused with motion graphics or animation, this workshop delved into the countless graphic props that need to be designed and produced for film and TV. After the podcast I asked the students to share their favorite period piece and their responses ranged from Pride and Prejudice to Stranger Things. From there the students researched the aesthetics of their targeted era and created a mood board to depict a collage of the various visual styles of the times. This was only a 2 hour workshop so students were challenged to execute their ideas with a very short turn-around. At the close of the session, students shared what they created and reflected on their process. Through the discussion, students were able to distill a number of key take-aways about graphic design for film and TV, including the importance of research, the reliance on storytelling, and the need for continuity. Beyond the curriculum objectives, students walked away learning about an entirely different facet of the graphic design industry, about their own creative process, and about what is needed to rapidly produce a proof-of-concept. Perhaps the biggest win for me as an instructor was that students were able to make the connection between creating something they were proud of and the need to give themselves ample time to do so! I ran this workshop with another group of students and was struck by their innate reliance on research and process. When tasked with this assignment, I was slightly overwhelmed. I chose to the 1977 Italian classic Suspiria, because it's one of the most visually appealing horror films I’ve ever seen. I started by creating a mood board on Pinterest to capture the feeling of Europe in the late 70’s. I tried to think of a graphic design related prop that would be relevant to the story and the protagonist, Suzy. After re-visiting the synopsis, I recalled that Suzy was a dancer moving from New York City to Europe. I used these aspects of her character to determine she was likely a fan of Broadway shows since she was a student of the arts in NYC. This made the answer to my “What on Earth do I design?” question quite simple - a Playbill of course! 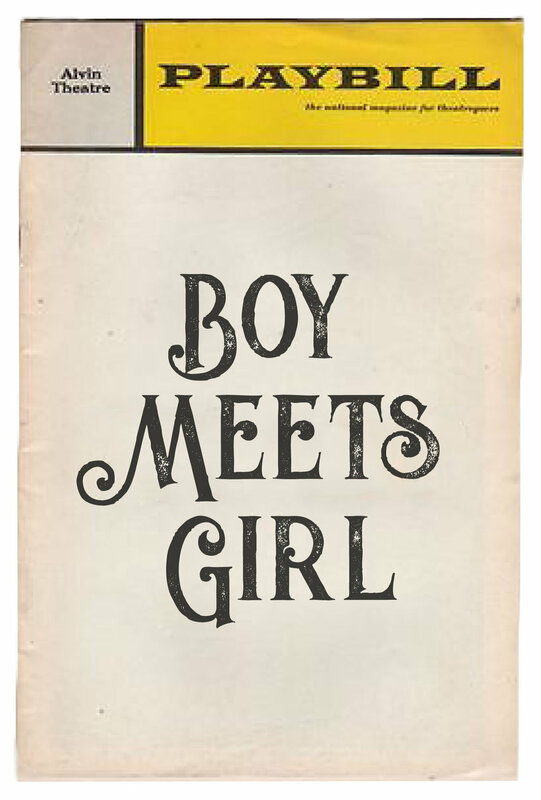 After additional research and procuring assets online, I found a Playbill circa the late 1970’s, removed the existing graphic, and replaced it with a play that was released in the Spring before her move, Boy Meets Girl. I facilitated this workshop with another group of Media Communications students during the summer of 2018 and was impressed by this student's approach. When thinking about how to implement realistic graphic design into the world of Blade Runner I thought of what it might be like to hear about or read about the series corporation giants and their leaders. 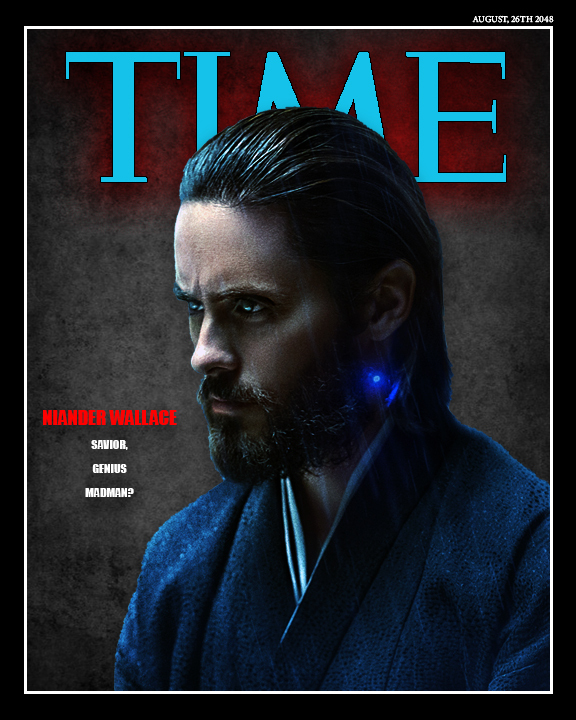 Since the newest film revolves around the technology created by the incredibly intelligent, yet controversial figure, Niander Wallace, I wondered how a TIME Magazine cover featuring him might look. My original design had the typical red border and font, but when reflecting on how the world of Blade Runner might influence the aesthetic, I opted for a black border followed by a electric-blue color for the font, with a red-neon glow surrounding it. The subtitle of the issue reads, "Niander Wallace: Savior, Genius, Madman? ", to highlight the nature the character plays in the world of Blade Runner. A savior because of his life saving genetic farming technology, a genius because of his unmatched mind, but perhaps a madman given his unstoppable resolve to push the boundary of Replicant technology.